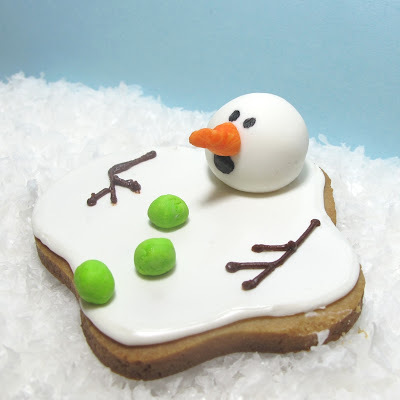 And now for the second installment of SNOWMAN FUN!! 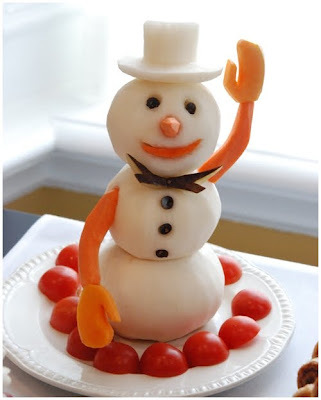 There are some super cute ideas in this post from all around the web -- I hope they inspire you all to take a break from the cold weather and have a little indoor snowman fun this winter. 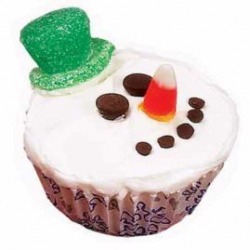 First up, Amanda's Parties To Go Snowman party printables set - so cute and affordable, too! Be sure to check out the set in my Etsy shop and also the BIRTHDAY version and INVITATION, too! And these are super simple to make - Snowman Marshmallow Pops full tutorial here. 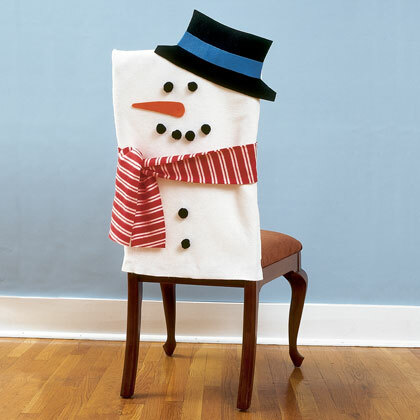 Family Fun has an fun idea for your snowman party -- Snowman chair covers. They have a tutorial with a little sewing involved, but I think it would be a little easier to use a white pillow case and then glue some felt pieces and buttons or pom poms on. 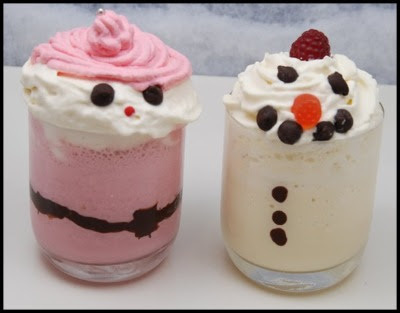 Now who wouldn't love to dig into these sweet snowgirl and snowman milkshakes from Whisk? I still can't get over their adorable-ness! The perfect drink for you snowman table. And I certainly can't leave out Bakerella and all of her creative culinary perfection! 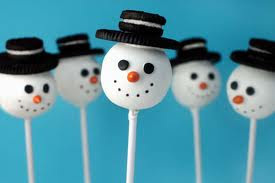 Snowmen cake pops with Oreo hats would fun on a dessert table or even wrapped up as a sweet little party favor. 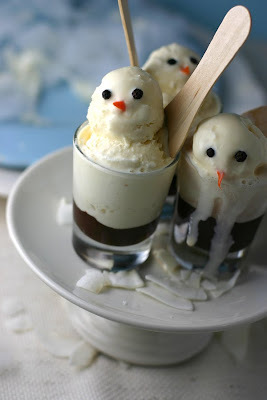 Snowman shots from Babble look super easy. 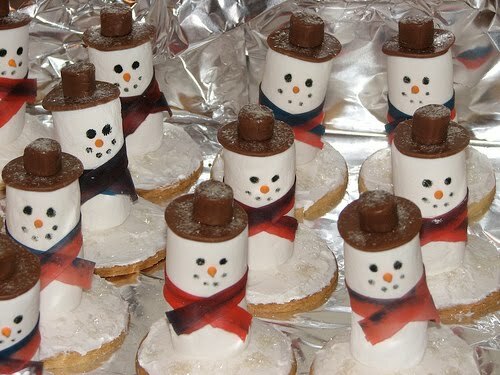 Make them before the party and set them on a cookie sheet in the freezer. Then all you have to do is pop them out to serve. 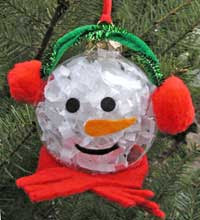 Here's a simple little craft that might make a fun party activity, a snowman ornament from Craft Passion. 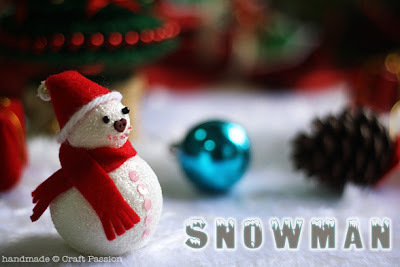 Craftbits has a cute snowman ornament craft that could be a fun party activity and favor as well. I just loved this picture, and then unfortunately didn't copy down the link. I have searched and searched but it's lost somewhere on that world wide web. If anyone can help find the source, please let me know, but isn't it the cutest?? 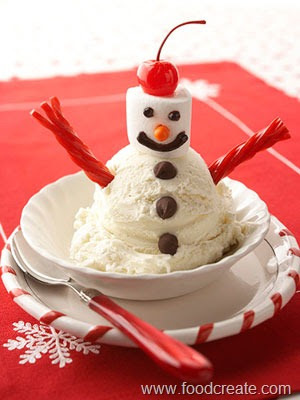 And another yummy snowman treat -- this one from Food Create using ice cream, chocolate chips, a marshmallow, a chery and Twizzlers. Snowmen Treat Bags from Crafts by Amanda would be a fun party activity, too. 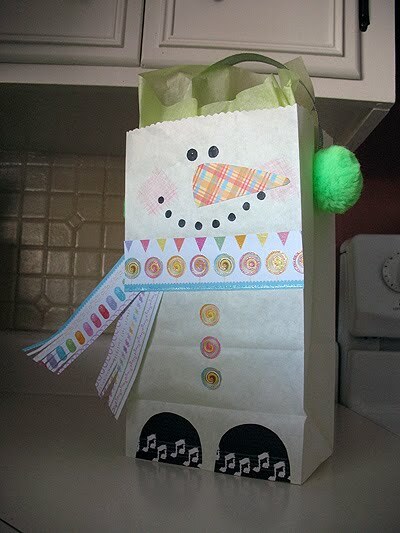 Have all of the pieces cut out and ready for the kids to glue onto an ordinary white paper bag. Then they can use it as a favor bag as well. Adorable Snowmen Cupcakes from Meet the Dubiens make me want to go to my kitchen right now and start baking! How adorable! 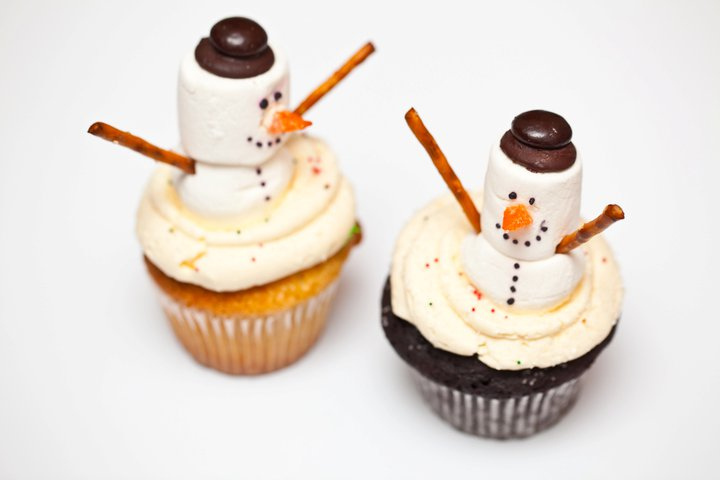 You might have seen these snowmen cupcakes from All You with their sweet little ear muffs. 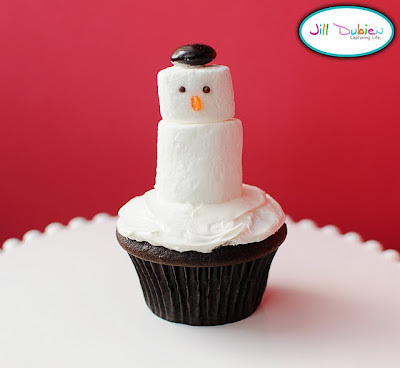 And Betty Crocker has a great snowman cupcake, too. I love how simple all of these ideas are using items you probably already have in your pantry. And if you are in a hurry, these couldn't be more simple from iElixa.com . Wouldn't your kids just love these cuties?? 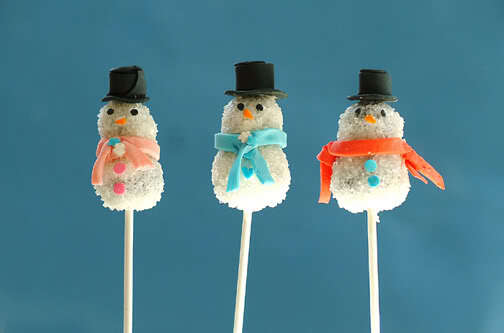 Snowman cupcake pops from My Little Cupcake with their precious hats and scarves would thrill my little ones! 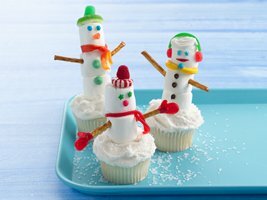 These look pretty simple to make from Cupcakes Take the Cake. And another cute marshmallow snowman treat from Keen Cakes this version uses a decorated sugar cookie as a base. And I'll end with one of my favorites -- Mr. Melty cookies from Chic Cookie Kits just bring a smile. How ingenious! I hope you all have a great day today -- get those presents bought and wrapped soon! It won't be long before Christmas! 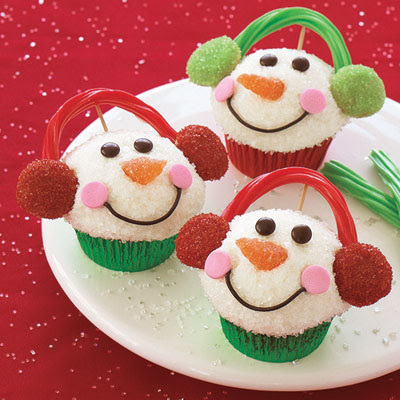 Love the cupcake snowman with ear muffs! Tooo cute! Thanks for sharing all these fab ideas! Sharing you on my facebook fanpage, pirates-n-princesses. I think the snowman image is also from the "Whisk" blog from Dec. 18. Hope that helps. Thanks so much Suzie, Heatber and Melissa. I'll be sure to link to Whisk as soon as I get home from travelling. Merry Christmas everyone! Thank you thank you for so many great ideas! I'm scrambling to throw together a last-minute party (my own fault!) and this helps SO much! Thank you for sharing this fun chair cover! I loved it so much I included it in my inspiration board today! Thank you for sharing!